CPS Camp No. 24, subunit 2, Williamsport Maryland. 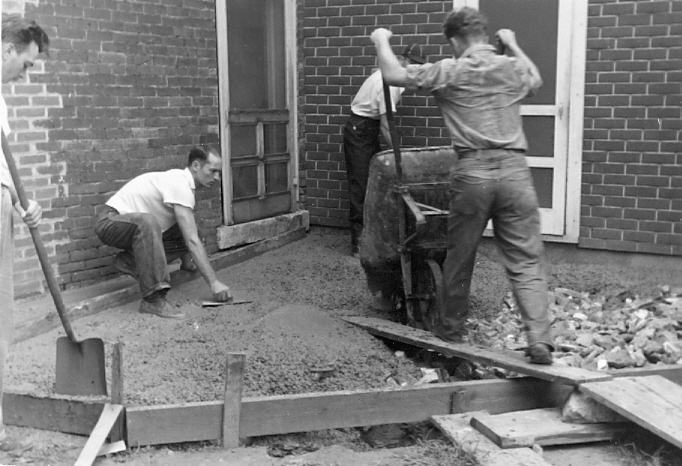 Pouring concrete for the back porch; August 26, 1942. Photo by Robert M. Seese. Digital Image © 2011 Brethren Historical Library and Archives. All Rights Reserved. 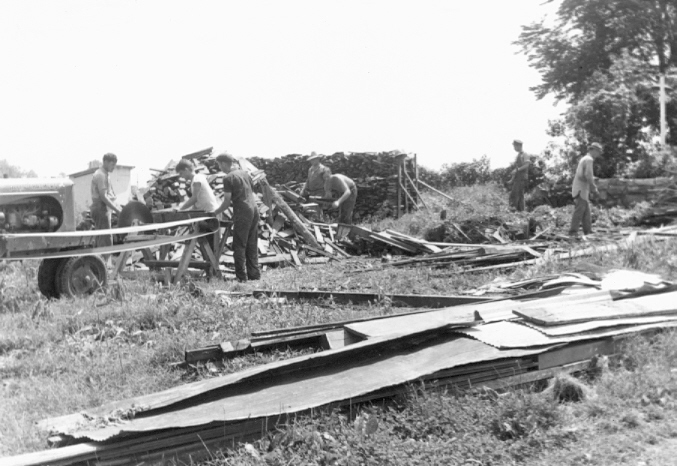 Part of the Saturday afternoon crew sawing up scrap lumber and mowing weeds; Aug. 26, 1942. Photo by Robert M. Seese. CPS Camp No. 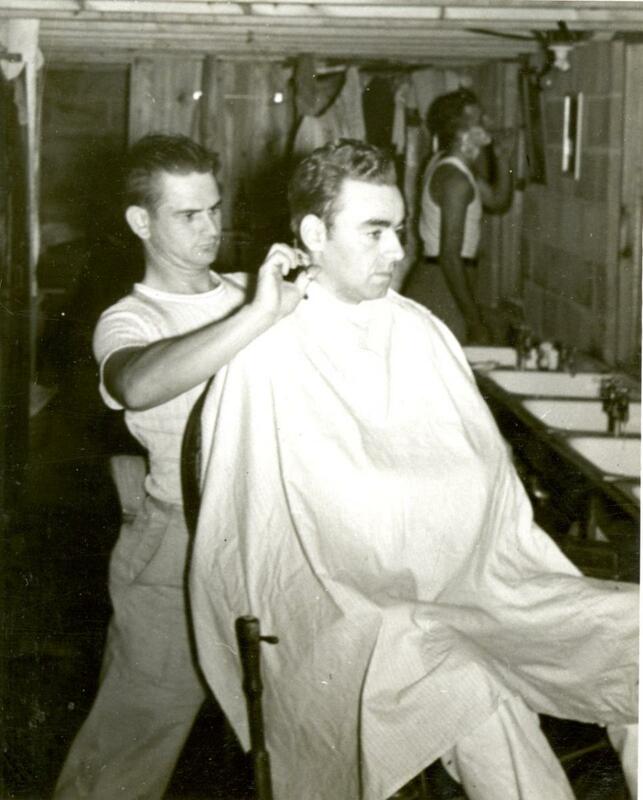 24 Subunit 5 at New Windsor, Maryland, a Soil Conservation Service camp in New Windsor, Maryland operated by the Brethren Service Committee, opened in September 1944 and closed in September 1946. The men lived on the campus of a former Brethren college, Blue Ridge College, and developed soil conservation measures on cooperating farms in the district. The New Windsor educational program emphasized rural interests related to soil conservation and rural rehabilitation. The men lived on the campus of a former Brethren college, Blue Ridge College, now the site of the Church of the Brethren Service Center. The men in this special conservation project developed soil conservation measures on cooperating farms in the district. Men farmed two fields of Brethren Church property, grew some garden produce and developed a demonstration plot in contour planting and contour strip cropping. Much of the time the men fenced off pasture land too far eroded to be under cultivation, fenced off woodland to keep cattle out, relined fences on the contour and constructed contour furrows and terraces. 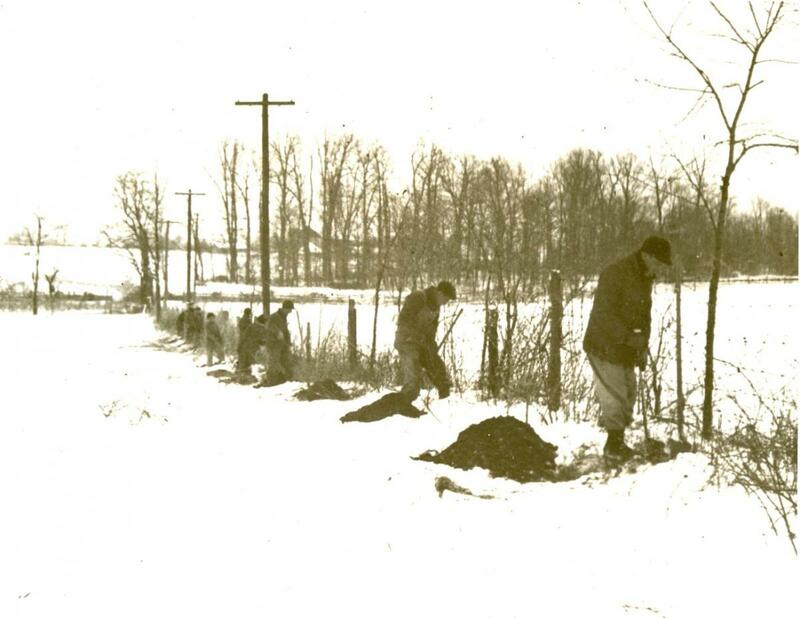 They also planted trees and improved the timber-stand in woodlots on the farms. While the Brethren Service Committee took primary responsibility for the operation at New Windsor, it related to the Mennonite Central Committee in the same way as at CPS No. 24 (2) Williamsport. Four assignees served as directors. New Windsor developed an educational program emphasizing rural interests related to soil conservation and rural rehabilitation. Men took formal classes in different phases, including Land Use, Agronomy and Horticulture, Forestry and Wildlife. After those concluded, the program continued using a series of interest group meetings including discussions and case studies of a particular farm. Several related soil conservation to the religious concept of “stewardship of the land”. The Richland, Pennsylvania church demonstrated this theme through a program of readings accompanied by choral works. The men named their camp newspaper Stewardship, which was published from November 1945 through April 1946. Since the men lived on the grounds of the former Blue Ridge College, a Brethren institution converted to a Brethren relief center, they found common interests with the staff. The two separate groups shared dining facilities as well as recreational and other spaces and jointly participated in several music groups, basketball and volleyball teams, as well as educational programs, and religious services. The CPS unit members attended several small churches in the area. For information see Leslie Eisan, Pathways of Peace: A History of the Civilian Public Service Program Administered by the Brethren Service Committee. Elgin, IL: Brethren Publishing House, 1948, pp. 269-272; pp. 321-324 for information on Windsor relief center activity in 1946. See also Mulford Q. Sibley and Philip E. Jacob, Conscription of Conscience: The American State and the Conscientious Objector, 1940-1947. Ithaca, NY: Cornell University Press, 1952.